In the late 80’s this BBC program was very popular and I’m sure many will remember being a viewer. It has now came to the stage in London’s West End. It is written specifically for the stage by Antony Jay and Jonathan Lynn, the original writers of the show. It has a good cast including David Haig as the Prime Minister and Henry Goodman as Sir Humphrey. The whole cast was nicely balanced, other main parts are played by Jonathan Slinger as Bernard, and Emily Joyce as Claire Sutton. All were first class, faultless, and really got the most out of the script. The stand-out for me was Henry Goodman as Sir Humphrey, some incredible lines, cheeky little laughs and perfect timing meant he was all round perfect. But it seems unfair to pick one as all were on an equal level. Brilliant writing, lots of topics up-to-date to an extent I didn’t expect. I don’t want to put in too many spoilers but certain lines such as those on the vatican were comedy gold. And the politics issues were also bang on. No parts of the show seemed to drag. The whole storyline in fact was very good. A smart set with some cool effects thrown in during the second half of the show. Some good props including lots of alcohol for the Prime Minister as well! The whole theatre is a gem of a building which is a pleasure to visit. I highly recommend you go and see if it you can. A brilliant evening out, no matter your age (you don’t have to have seen much of the original to enjoy this!) 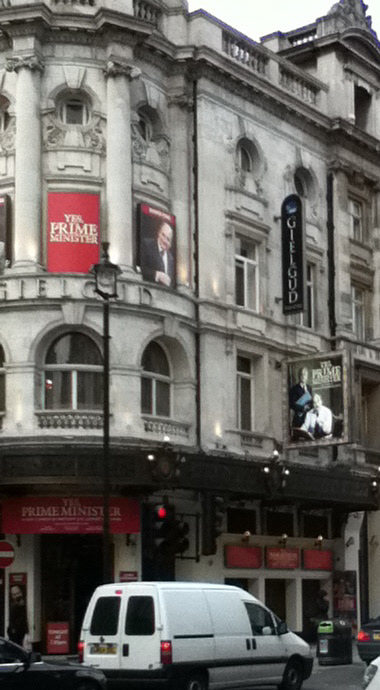 It is at the Gielgud Theatre on Shaftesbury Ave. Beautiful theatre. For the price it is excellent entertainment so real value for money, and a trip to the West End is always good fun so make a night of it! You can read more about it and buy tickets at www.yesprimeminister.co.uk. Saw this at Richmond tonight. Photographs on the set included one Prime Minister I couldn’t identify. Can anyone enlighten?